Back in 2008, United Airlines broke Dave Carroll's guitar and refused to pay for it. In light of the company's most recent customer service debacle, we checked in with him —and it turns out that incident turned into an unexpected opportunity. 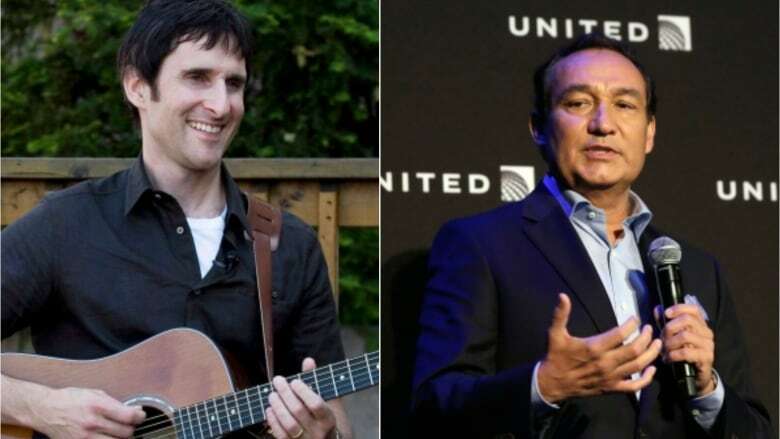 A man who became a YouTube sensation after he wrote a song about United Airlines breaking his guitar in 2009 is speaking out after the company came under fire for forcibly dragging a customer off a plane. Dave Carroll, a Halifax musician, was flying on United to play a show. Sitting on the tarmac before takeoff, he looked out the window and saw baggage handlers throwing guitars around — and when he arrived, his guitar was broken. It cost him $1,200 to fix his beloved instrument and United refused to pay, so he wrote the song United Breaks Guitars and uploaded it to YouTube. Carroll's song went viral and helped him launch another career as a public speaker advocating for compassionate business practices. He also wrote a book called United Breaks Guitars: The Power of One Voice in the Age of Social Media. On Sunday, after a passenger was filmed being dragged off a plane, United has a new public relations crisis on its hands. As It Happens host Carol Off spoke with Carroll to see what he thinks of the airline's latest customer service disaster. Here is part of their conversation. Carol Off: Dave, I didn't think that you and I would be talking about United Airlines again since they broke your guitar. What do you make of this latest incident? Dave Carroll: I think I was as shocked as everyone else. I discovered it myself after touching down in Halifax yesterday. Ironically, I was coming back from a customer service meeting where I was sharing my United Breaks Guitars video. My phone lit up with interest and some requests. I saw the video that everybody else has seen now. It's pretty horrific and I felt for everybody on that plane. CO: I guess why you got all those calls is people remember what happened to you and your song. United Breaks Guitars became a bit of public relations fiasco for United back in 2009. Is your sense then that they haven't learned very much since your encounter with them? DC: I would have thought they'd make some advances, but seven years later now, the same sort of problem has emerged. I think it has to do with a culture in the company. When my video went viral, I received letters from the flight attendants and the pilots associations, on their letterhead. I'm paraphrasing but they said, essentially, "If you think it's bad flying with us, try working here." So how are you suppose to dazzle your customers with great customer service if the people providing the services feel such disconnection throughout the company? I think they have some problems that they have to change culturally, and I think if they bring more compassion into the conversation they'd be better suited. CO: We heard from the CEO of United, Oscar Munoz. He released a statement after the incident where he apologized for having to "re-accomodate" customers and said that they were investigating. That was the extent of his comment. He was widely condemned for that. Now, today, he has gone further saying they've all responded with outrage, anger, disappointment and they have the deepest apologies for what happened. Why do you think it took 24 hours for the CEO to figure that out? DC: It's a mystery. The first one was so awful. I think a billion dollars in market cap later, they realized that this one story is actually affecting the profitability of their company, so he had to step up and give a more heartfelt apology that showed caring and showed respect for the person who was affected. It's not just a story. This is a person who was actually humiliated and assaulted on a plane and that needs the personal attention from the leader and the voice of the entire brand to the person affected. The second apology was where it should have been in the first place. CO: Do you think the first apology, he was thinking about liability issues? DC: Yeah. I think, especially in big brands, they surround themselves with a single focus. In this case, a room of lawyers are taught how to protect the brand on the basis of what is legally entitled and that sometimes should be much farther down the list. If a company is a little bit more compassionate, they can have better outcomes and empower, not just their employees, but their passengers to think differently about their brand to the benefit of everybody. Ultimately, I think the big story behind United Breaks Guitars has always been about the lack of compassion that was there and why compassion should be a central feature of your culture. This interview has been edited for length and clarity. For more on this story, listen to our full interview with Dave Carroll.